Bear has never really had any visitors and he is "quite sure" that that is how he likes things. Just to make sure that no one tries to pay him a call, Bear has a "NO visitors allowed" sign on the door. Then one day someone comes and knocks on Bear's door. 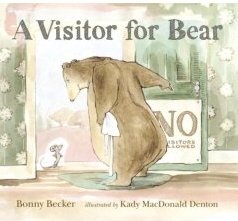 When Bear opens the door he sees a small gray mouse standing there. After making it clear that he does not want anyone around and firmly closing the door, Bear goes back to making his breakfast. The thing is, when Bear goes to his cupboard to get his breakfast bowl he sees that the mouse is sitting in it. The same mouse he just saw at the door. Determinedly Bear shows the mouse to the door. And just as determinedly the mouse makes his way back inside. This time Bear finds the wily rodent in the bread drawer. After roaring for the mouse to ""vamoose!"" Bear locks the door (several times) and closes the windows. Alas for poor Bear. He does not have a clue what he is dealing with here. In this funny and deliciously sweet picture book, Bonny Becker shows her young (and not so young) readers how precious friendship is. Children will be hard pressed not to laugh as Bear desperately tries to get rid of his unwelcome guest. They will want to know what happens next, and they will want to know who wins this epic battle of wills. With great skill, very little fluff, and just the right touch of drama, Kady MacDonald Denton has created the perfect illustrations to accompany Bonny Becker's text. The expressions on the faces of Bear and the mouse are priceless, and would be artists will see, to perfection, how not too much can hit the spot.